(Picture: Edward Diller – DiBella Entertainment/Star Boxing) MASHANTUCKET, Conn. (September 29, 2012) – Undefeated Edwin “La Bomba” Rodriguez (22-0, 15 KOs) made a major statement tonight in the main event, punishing a tough, previously unbeaten Jason “Monstruo” Escalera (13-1-1, 12 KOs) until referee Steve Smoger called off the fight at the start of the eighth round, on tonight’s special HBO Boxing After Dark tripleheader in MGM Grand Theater at Foxwoods Resort Casino in Mashantucket, Connecticut. “Road To Glory” was promoted by DiBella Entertainment, in association with Joe DeGuardia’s Star Boxing and Gary Shaw Productions. 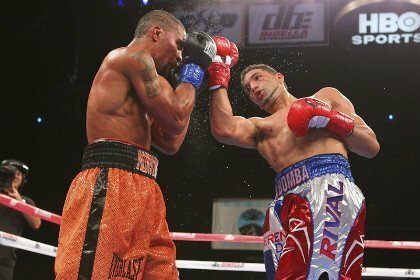 Rodriguez came out after the first bell throwing bombs and nearly dropped a game Escalera on several occasions, winning 10-8 on all three judges’ scorecards, and the dynamic Dominican living in Worcester (MA) never let up in his first United States Boxing Association (USBA) title defense. He won every round convincingly, showcasing his entire arsenal in the process. Rodriguez is closing in on a major fight, if not a world title shot, and is rated No. 3 by the World Boxing Council (WBC), No. 4 by the International Boxing Federation (IBF), No. 8 by the World Boxing Association (WBA), and No. 9 by The Ring Magazine. Three-time, two-division world champion Vic Darchinyan (38-5-1, 27 KOs), fighting out of Australia, won a dominating decision over previously undefeated Luis “Orlandito” Del Valle (16-0, 11 KOs) for the vacant North American Boxing Federation (NABF) super bantamweight title. Darchinyan outworked the 25-year-old Del Valle, who is rated No. 4 by the WBA, effectively pressuring his opponent and repeatedly finding Del Valle’s chin with powerful left uppercuts. In the HBO opening fight, French-Canadian welterweight Antonin Decarie (27-1, 8 KOs), rated No. 7 by the WBC, introduced himself to American fans with a bang, knocking out previously unbeaten Alex Perez (16-1, 9 KOs), of Newark, New Jersey, in the sixth round. Decarie won the first five rounds on two judges’ cards and led 4-1 on the other. Near the end of the sixth round, Decarie caught Perez with a left hook and then a right cross as Perez was rocked. Decare pinned Perez on the ropes and unloaded a series of solid punches until referee Danny Schiavone stopped the fight with six seconds remaining in the round. Decarie won the vacant North American Boxing Association (NABF) title to go with his WBC International that was not on the line. Backed by an enthusiastic Irish-American crowd, fast rising super lightweight of Danny O’Connor, of Framingham (MA), put on a show for his fans, stopping Josh “Nino Assasino” Sosa (10-4, 5 KOs) in the third round. Now managed by Dropkick Murphys band founder and lead singer, Kenny Casey, O’Connor trapped Sosa on the rope and unleashed a barrage of unanswered, vicious body shots until referee Eddie Cotton halted the action. World-rated cruiserweight Issac “Golden Boy” Chilemba (20-1-1, 9 KOs), fighting out of South Africa, turned in a workmanlike effort against veteran Rayco “War” Saunders (22-17-2, 9 KOs), pitching a shutout en route to a eight-round win by unanimous decision (80-72 X 3). Chilemba originally was supposed to fight on the HBO broadcast against undefeated, two-time world champion Zsolt Erdei, who was forced to withdraw with a rib injury. Chilemba is rated in the top 15 by all four major world boxing organizations, as high as No. 5 by the IBF, as well as No. 9 by The Ring Magazine. Popular Massachusetts super lightweight Ryan “Polish Prince” Kielczewski (14-0. 2 KOs) remained undefeated, outclassing Jeremy McLaurin (9-4, 5 KOs) in an impressive victory by six-round decision. Local favorite Luis “KO King” Rosa, Jr., fighting out of New Haven (CT), ran his perfect record to 11-0 (6 KOs) with a sixth-round technical knockout of New Jersey super bantamweight Victor “The Viper” Valenzuela (8-4, 1 KO). Crowd-pleasing Greek heavyweight Sonya Lamonikis (7-0-2, 1 KO) kept her unbeaten record intact, taking a six-round majority decision over heavyweight Tanzee Daniels (4-2-1, 1 KO).